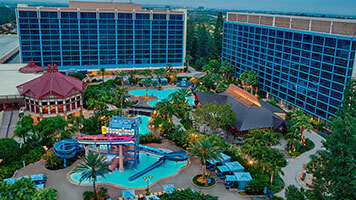 For the ultimate Disneyland vacation, you should definitely stay at the Disneyland Resort Hotel. With 990 rooms in three high rise towers, this is the original Disney Hotel, located in Downtown Disney. If you want to truly experience all that Disneyland has to offer, you must stay at the Disneyland Resort Hotel. The guest rooms in the Disneyland Hotel are astounding. Offering standard rooms and suites, each room has either a king size bed or two queen size beds, room service, phones with voicemail, irons, ironing boards, refrigerators, hairdryers, make up mirrors, and safes. Cribs and roll away beds are available, as well as smoking and non-smoking rooms. The rooms are even sprinkled with Pixie Dust! For families, the suites are highly recommended. Suites contain one, two, or three bedrooms, and have all of the amenities of a standard room as well. The Concierge service at the Disneyland Hotel cannot be topped. Concierge service entitles you to priority check-in, admission to an exclusive lounge, a continental breakfast, an evening wine and cheese reception. Nightly turn-down service is included, as well as DVD players and complimentary movies. You will also have an unlimited supply of bottled water and soft drinks. The Concierge serves to make your vacation as enjoyable and trouble-free as possible. Disney touches are everywhere, and this is the closest you can actually come to living in Never Land. The swimming pool even has a Never Land theme, and there are several cove pools and a sandy beach. The hotel also features a children’s playground, a volleyball court, and Koi fish ponds. The recreational area encompasses a 5000 square foot area inspired by Peter Pan. There are many scenic waterfalls, tropical foliage, and mysterious caves on the property. There is even a Team Mickey work out room full of state-of-the-art gym equipment. At the Disneyland Hotel, you will feel like your Disney experience has truly already started as soon as you walk in the door. This is where the famous Goofy’s Kitchen is located, as well as The Captain’s Galley, The Coffee House, Crocs Bits ‘n’ Bites, Granville’s Steak House, Hook’s Pointe, The Wine Cellar, and The Lost Bar. When you stay at the Disneyland Hotel, your vacation continues even after a day of sight seeing and attractions in the park. In fact, your Disneyland vacation begins each and every morning when you wake up in the Magic Kingdom that the Disneyland Hotel represents.